We have to start the review of the SimplySleeper SS-58RF with an apology. We’re almost a month late with the update on this model, and our apologies go to all of you who have been sending us E-mails asking what’s going on. The thing is, we wanted to do a few new tests on it, and we had to wait for a couple of featured testers to send in their reviews and ratings. It’s no small deal, because this mattress is one of the 4-best rated airbeds Overall. It’s all up and running now, so we can pick up right where we left off almost three months ago. The main issue that we are seeing with this air mattress if that it goes out of stock so often, and instead of getting it directly from SimplyGlobo, the potential customer is left with the option of getting it from other sellers that sell it for 2-3 times as much so instead of getting it for the regular price (under 250) people have to pay twice or trice as much. We contacted SimplyGlobo a few times about this and were assured that they’re working on it. The first time they said was like a year and half ago. Bottom line – if you do find it available for a regular price (again, under $250) you can consider yourself lucky. In this update, it ranked higher for both durability and comfort, which allowed it to share the 3rd/4th position in our “Best High-Rise Air Mattress” guide with Insta Dura-Beam. SimplySleeper models are well-known for their slew of patented technologies. This one is no different, it’s main forte being, the unparalleled durability and reliability, similar to those of it’s younger (and yes, somewhat inferior) “brother” – the SS47T. Let’s take this air mattress review a step further and see what the recent users had to say about it. I really like that the sides are firm for once. I mean, it’s not all that crucial in the large scale of things, but I still want to be able to sit on my bed before I crash. Good job! 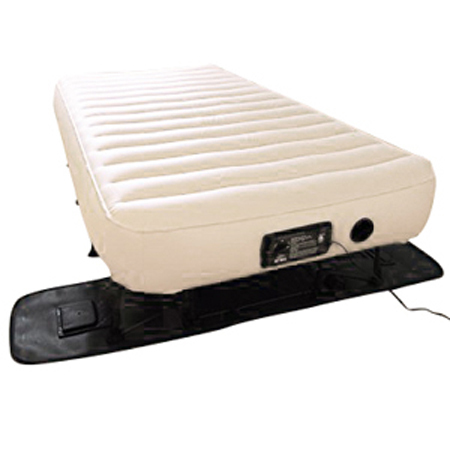 This air mattress just keeps on growing in popularity for some reason. It improved in two of the categories since the last update, which is not a small feat. SoundAsleep Queen Size improved only in one this time around. It all indicates there is a bright future for this model under the hat of 3Beds. Now, don’t get me wrong. I don’t think it’ll ever have what it takes to surpass SoundAsleep, but it’s definitely welcome to try. Comfort and durability are the two main points customers focused on. It’s the top choice in both those categories and we don’t see that changing anytime soon. So, basically we have everything that makes a decent air mattress packed in one convenient package. These are just the most prominent features; we also have a good-quality pump and air retention ability. It’s the real deal. There are plenty of reasons to buy this air mattress right this instance, but we also have some of the CONs to talk about. Let’s try and explain them one by one. Some people like more cushioning than others, so there’s no correct recipe there (for now). The main point about this problem is that it’s easily solvable. Just get a thin foam toper and you’re good to go. It also squeaks on hardwood floors while it’s new. Well, that’s a fact. We’ll just have to weigh some PROs and CONs on that one. Don’t worry; we do that all the time here. It’s a piece of cake. Another thing we can do nothing about is the size of the mattress. It’s too short for extremely tall people, and there’s nothing to be done there. The lip on the surface is also a point of contention, it would appear. It’s there to give the structural support to the mattress and to prevent the sleeper from falling out. If you don’t like, the cheap foam topper is your problem solver once again. We hope you found this air mattress review informative and well-worth the wait.